A Classic relaxer, contemporarily crafted from solid wood and accented with steel hardware finished in bronze. The contemporary Silhouette features clean lines and emphasizes comfort and style. 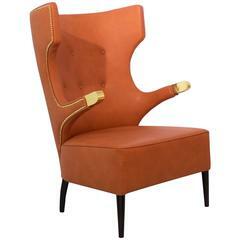 The chair is upholstered in distressed leather in an espresso finish. Dimensions: 30" W x 40.5" D x 30" H.
Armchair golded touch in synthetic leather with black glossy lacquered feet and golden polished nails and finishing. Armchair structure base in cast aluminium. Structure base in tubular steel and painted. Seat, backrest are in plywood, and grey upholstery.